These photographs show Division Avenue (today's 84th Avenue) looking west past Beech Street (today's 120th Street). 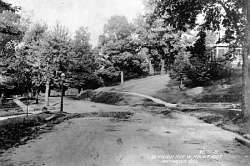 Lefferts Avenue (today's Lefferts Boulevard) lies one block in the distance. If you graduated with us, you will understand why we combined our names. We were rarely apart. Thankfully, we are still best friends. We aren't in NYC anymore but would love to hear from anyone who graduated with us. We laugh about 99 all the time and wonder how everyone is doing. Jess still has her class t-shirt. We had a serious talk with her and she only wears it on special occasions now. Email us, we would enjoy hearing about what everyone is up to. Your photo of the Chase Manhattan Bank on Lefferts and the building to the immediate right of the bank brought back a flood of memories. Dr. Jaye had his office on the second floor. He kept unorthodox office hours (i.e. His office rarely closed.) I would often call him at 10:30 PM complaining of a toothache and would tell me to come right in. He was somewhat of a "health nut". He kept a refrigerator in his office and I never saw him eat anything but cottage cheese and melba toast. He kept what he referred to as his "$1200 Dutch Racer with drum brakes" behind the door to his office. He said he rode 25 miles every Sunday. He prided himself in his vocabulary, kept a dictionary on his desk and was frequently asked people if they knew the meanings of different words. I'll never forget the red phone next to the dental chair. It was his direct line to his stock broker. It was not unusual for him to buy and sell stock while filling a tooth. He particularly enjoyed arm wrestling with me, after an appointment. He always won. I recall that when I accompanied my mother to his office for one of her visits, he would give me some mercury in a paper cup to play with. I'm sure the FDA would have a thing or two to say about that practice, today. Inspite of his meticulous health practices, exercise, etc., I believe he died at the age of 65. Having had cavity prone teeth (prior to fluoridation), I spent a lot of time with Dr. Jaye. I'd be interested in hearing from others who knew Dr. Jaye and had anecdotes to report. Since I've taken to reading the archives, I thought I'd throw in a few memories of my own. I remember my first days at PS 99 going back to 1943. I remember recess which was my best class. I remember all of the scraps I got into as the new kid on the block. I remember trying to break up a fight between the Morganbessers and having my tooth broken in the process. Now that I think about it, it was a wonder that I learned anything since Richie Wolin, Eddy Gallen and Joel Gluecroft assured me that I would be spending more time in the cloak room than any living student in PS 99's history. Yet, I do remember with great fondness many of the students and of course Ms. Oliver and some of the great teachers who helped shape me as a person. Ms. Oliver kept me from being tossed to the wolves on many occasion when most had already given up on me. I was so sorry to hear of her untimely demise. And I remember Mrs. Wall, Mrs Seabury, Miss Smith and of course the Ellenports whose daughters were delightful. Later, I would drive Ina to college in my old jalopy. I remember Barbara Felsing who I tested my first set of boxing gloves on and who made me see stars when she landed one directly on my chin and I collided with a nearby wall. I remember all of the good parties. And going to the Austin with Abby Rodell who lived on Abindon Rd. 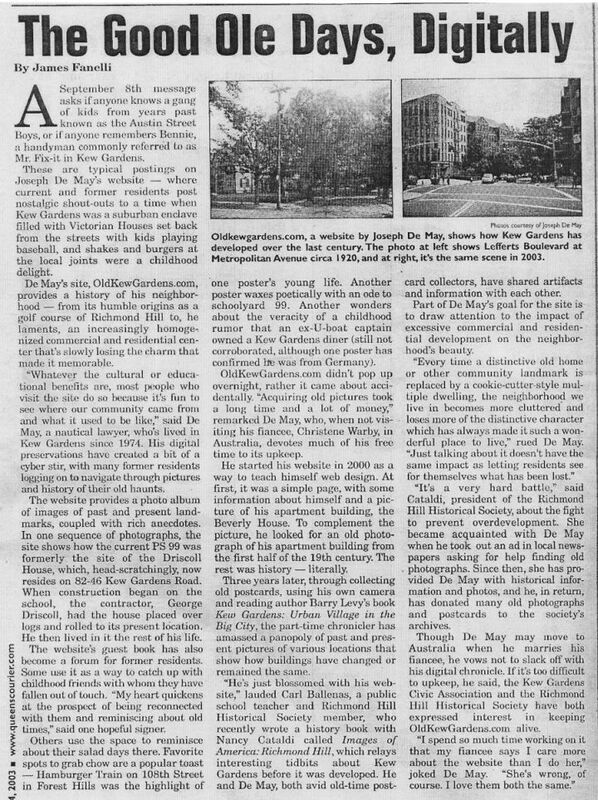 In those days, we lived on Metropolitan Avenue off of Lefferts. Living in Kew Gardens was a terrific experience for a kid who had only seen trees before in Central Park. In Queens, we had parks and woods and corner lots where we could indulge ourselves in punch ball, Ring O Leevio...stoop ball, chinese handball, stick ball and you could feel like a million and all you needed was a Spaldeen and a broomstick with the requisite black masking tape. Having done a lot of traveling since those days, my thoughts happily return to those great days and my old class mates. 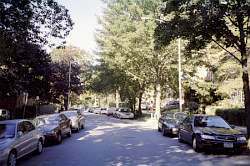 In one of the Richmond Hill posts, I read that some of the students who had also attended 99 asked about a classmate, Peter Mayer, who some might remember.Interestingly, my wife was working for the Chairman of Penguin publishing when he got into a serious accident at his home in Woodstock. We, living part-time in Margaretville at the time and rushed to Woodstock to see him at the hospital. At that time, he was covered in bandages. Only later did I realize that my wife's boss was Peter Mayer who I had attended school with in Richmond Hill and PS 99 which should answer that question of 'where's Peter?' The last time I saw Peter, he was fine and representing Salmon Rushdie which by itself was an interesting exercise. Many of the others I lost track of over the years. Anyway, it was good looking at the photos of the class and seeing some old friends (class of 1950). I wonder how many remember Pep McGuires, the Pastrami King on Queens Blvd, the Austin theatre, the candy store across from the Austin that still carried penny candy, Jahn's ice cream parlor where I accidently tripped the manager Ernie when he was carrying the Kitchen Sink only to see a Mondrian painting created on the fly across all the walls of this favorite landmark and being banned for six months for my carelessness, Wonderland on Metropolitan Avenue and the great appetizing shop next to it where you could buy a roll that tasted like something other than card board, the gals walking home with store-bought pickels, Howdy Doody, taking the subway into Manhattan and stopping at the Automat, or taking the bus down to Rockaway to go in Davy Jones Locker at Playland or the Hillside Roller Rink on Wednesday night... .... Those were certainly the good old days that I remember fondly followed by a great four years at Richmond Hill. If there's anyone out there who liked those times, too, please drop me a note and we can compare memories. My email is hubmaster@aol.com and my name is Les Friedlieb Class of 1950 PS 99. How's this for the small world department. I had traveled from my new home in Lewes Delaware to New York to take in a show and a good meal. It turned out that we headed to a fairly new Italian restaurant run by Lydia's son which we wanted to try called Pecco. Anyway, we were seated next to some other former New Yorkers and we were talking about the old 103rd st Irishtown as it used to be fondly called when I happened to mention that I went to Richmond Hill High School. Lo and behold, a gentleman named Howard, sitting across from us said that he went there too. THen he asked where I was from and I mentioned Kew Gardens and he said he grew up there. So we were off and running. Anyway, this now San Francisco resident pointed me towards this website. Having graduated from the June 50 class of PS 99, I thought I would check it out. I recognized almost everyone but didn't see my picture which is kind of scary since I was in the class. Anyway, it was good to rea! d about the old neighborhood. If anyone would care to write, my email address is hubmaster@aol.com and my name is Les Friedlieb Class of 1950 PS 99. In a guest book note dated October 16th., Clifford Tatum extols upon our editor well deserved accolades for the job he does in preserving the memories of Old Kew Gardens. What Mr. Tatum fails to mention (possibly due to modesty) is that he himself made an important mark as a citizen of the community by co-starring with Cary Grant in the 1952 Warner Brothers production of 'Room For One More'. He subsequently made a number of film and T.V. appearances and gained quite a bit of fame during that era. Clifford was a classmate of mine at '99' and lived in a building along Lefferts almost directly across from Talbot Street. He and I, and another classmate, Peter Friedberger, who lived in the same building and was also an aspiring actor, palled out together in the early years. Glad to hear from Cliff, and to add his name to our list of K.G. notables. Editor's Note: You can read Cliff Tatum's filmography by clicking here. In "Room for One More", Cliff played a physically handicapped boy. I think he would be the one on the bicycle in this still from the movie. Editor's Note: Another 15 minutes of fame has arrived for P.S. 99 alumnus, Jay Rogers, who is pictured on the Hendersonville News [.com] web site getting his flu shot. You can read the story and see the photo by clicking here. I was in this school until I was in 4th grade, because my dad had to go to Puerto Rico. I left with him and now I'm in a very excellent school. I wish I was back in The Kew Forest School, and if anyone recognizes this name, I'm in 9th grade right now. It was great fun to look at the faces on the newly posted PS99 1950 graduating class. I knew about half of those people. 2nd row on the left is Ronald Blake. 4th row, 2nd from the left, I believe is John Robertson. Paul Waldeck, you should have known this. We were all in the Boy Scouts together. (Miles was not in the Boy Scouts.) Hello Ruth, I still remember you. Devee, are you there? The fact that Rodney Dangerfield dwelled us is a fact and you know what he is still with us. He was the best comedian ever if you ask me I have had the opportunity of having a chart with him on an accation. He was generally not respected, why? I sure can't say. Well I think I agree with your kind gesture. I guess he deserves it as a respect and also a legend. Thanks for the move. In a guest book letter dated October 6th., Dave Straub asks where Rodney Dangerfield lived. Mr. Dangerfield resided in one of the most elegant cooperative towers in what is known as the 'Wilshire Corridor' section of Westwood, California (actually the 10500 block of Wilshire Blvd.) About two years ago, eastbound traffic on the boulevard in front of his building was rerouted temporarily so that a crane could deliver a new grand piano through his livingroom window (about twelve floors up). The event was so ala Rodney that it was covered extensively by the media. It appears as though nobody really knows exactly where Rodney Dangerfield lived in the Austin Street building, nor is it probable that anyone will ever find out! Despite this, it would be fitting for us as a community to make some permanent gesture to commemorate the fact that he did dwell among us at one time.I was thinking in terms of a simple bronze plaque denoting his name, and that he was a famed comedian who lived from 1921 to 2004 and resided in the building circa 1930's I would suggest that the plate be affixed prominently in the masonry façade at the residential access doorway of the building (with the owner's permission of course). I would certainly be happy to do my part by making a small donation to the cause. In this way, Rodney won't be able to say he don't get no respect! Editor's Note: Remember the very funny Jib Jab animated cartoon of a while back in which Bush and Kerry did a duet of "This Land"? Well, there's another one out, also funny, and it's called, "I Wish I was in D.C." sung to the tune of "Dixie". You can watch it by clicking here. The page will open in a new window. Close out the window to return here. Editor's Note: Users of Internet Explorer and most other browser will be able to place their cursors directly over one of the links above and get a description of the linked page. It saves you the time of having to go there. Editor's Note: Both Newsday and this site may be wrong in reporting that Rodney's apartment was located over today's Austin Ale House. Rodney visited the place last May 24th, and someone who was there to see it reports that Rodney's apartment was at the other end of the building over the spa. If so, then it is entirely possible that Rodney used to live right up the stairs from the vestibule in which, years later, Kitty Genovese would be attacked for the second time. I enjoy hearing from old classmates,If you remember me ,please drop me an acknowledgment.I would love to know what ever became of Dorothea Schwing Class of 1951 , Just want to say hello once again. Shouldn't we have a moment of silence for Rodney Dangerfield who grew up in KG & died today? We could give him the respect that he said in his schtick that he never got. Another genius is dead. Anyone know where he lived? He was 82 today when he died.